If you have an Xbox 360 or Xbox One, it's probably so you can play games—but Microsoft is looking to make its ubiquitous console into a more multipurpose device. The Xbox One is already trying its best to be your dedicated entertainment system with deep television integration, but new apps aim to make it an even better part of your TV viewing experience. Twitter, which has been on the Xbox 360 for a while, will finally be making the leap to Xbox One with as part of the console's TV features. Whether you're watching a show or browsing television listings, you'll be able to see relevant content from Twitter right on the screen. Though we're used to multitasking while watching television—often with a tablet or smartphone—this means there's no need to glance away from the action to keep up with the social buzz. 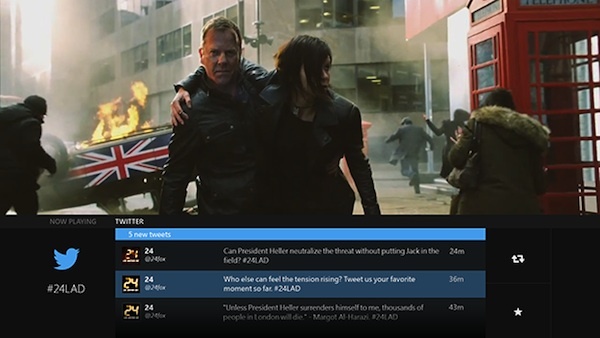 In addition to Twitter, lots of new streaming apps are coming to the Xbox 360 and Xbox One, including Comedy Central, ENCORE Play, EPIX, Fox Play, FXNOW, HBO GO, Infinity, MLG, ShowTime Anytime, STARZ Play, Syfy Now, USA Now, VH1, WATCH ABC, WATCH Disney Channel, and more—which makes it easier than ever to stream content directly to your television from your Xbox. Though entertainment apps like Netflix and Hulu used to require an Xbox Live Gold subscription to use, all Xbox owners can now access entertainment apps—including these new apps—without paying a monthly subscription fee to Microsoft. Apps will start launching this summer, and you can expect to find all of these apps on your Xbox by the end of the holiday season.